SOUTH OF SEATTLE, BY ANGELA ONLY. 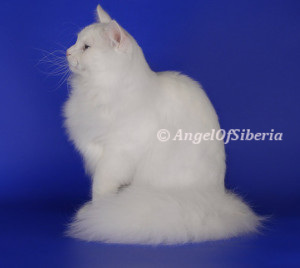 If anyone else is trying to sell you the kitten from any cats from the cattery ANGEL OF SIBERIA – it is a scam. I do not meet people half way or by the mall or by the freeway. 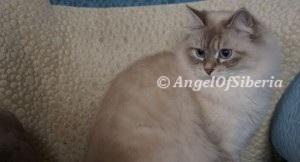 Please, come and see how my cats are raised and where they live and how they live. 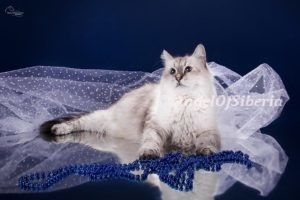 I will show you TICA and/or WCF registration, awards, and pedigree for each cat. Each kitten will leave the cattery with his/her own registration certificate. Click on his name in pink for more pictures! Oskar Angel Neva is our King. He is a TICA Champion and WCF Champion. Fantastic head, body type and fancy water repellent coat, full, fluffy britches. 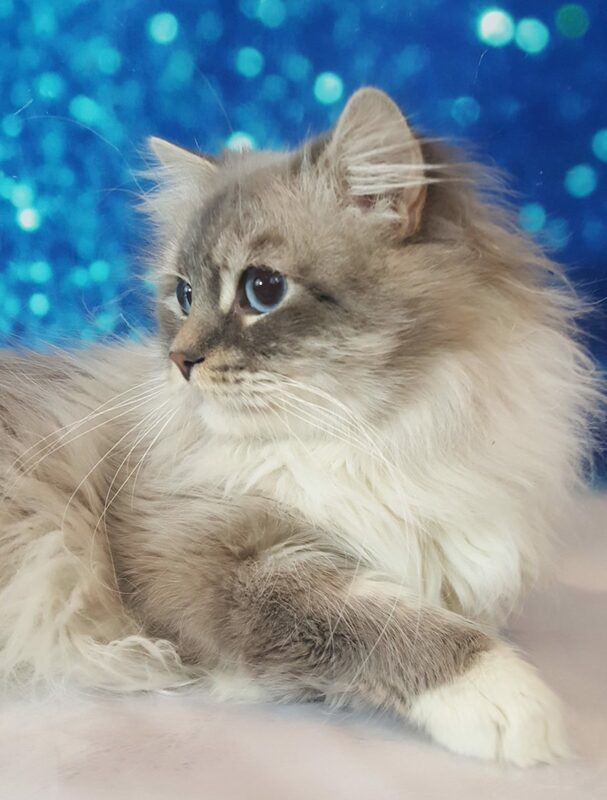 This is the type of Siberian, I am proud to own. He enjoys playing with our children. He expresses himself through a lot of sweet mews, trills, and lots of purring. Oskar earned his first championship through WCF at his 1st show when he was only 10 months old. Oskar earned his first championship with TICA at age 13 months. About the color: Silver means that the roots of the hair are white, which makes the whole appearance look lighter gray. Blue Lynx means gray stripes on the face, extremities, and tail. These colors are late in maturing and do not develop until the kitten is 10-11 months old. Oskar has 26 champions in his 4 generation pedigree. Oskar is registered with WCF and TICA. He also has Pedigree information. All documents available upon request. 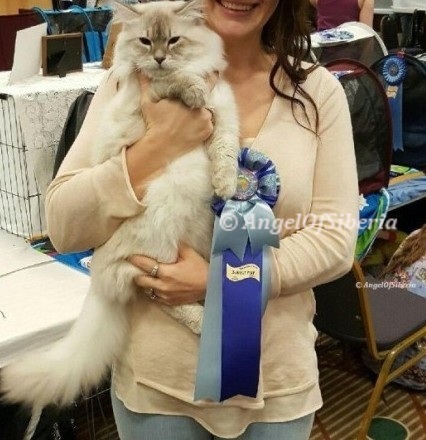 Oskar became a champion at his first TICA show! Click to view more photos of Oksar! 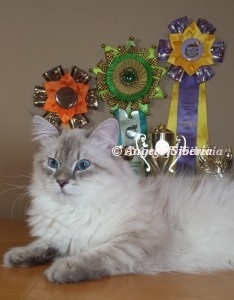 Oskar’s mother Budiyara Nevskaya Skazka and she is a Grand International Champion (left pic). 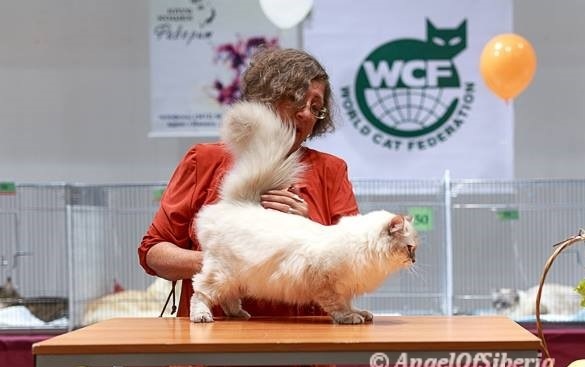 Oksar’s father Zhemchug Nevskaya Radost of Angel Neva and he is a Grand International Champion (right pic). Click on his name to view more pictures! Description: Our Golden King Jeweler has 47 champion in his 5 generation pedigree. 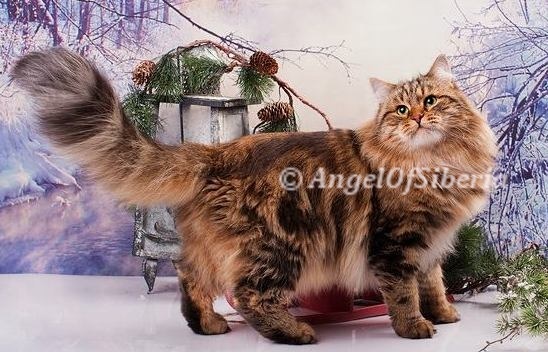 He was shipped to us from Angelur Cattery, located in Karelia. His ancestors came from a Swiss Cattery Von Mittelmeijer, famous for producing golden kittens with green eyes. Jeweler’s eyes are deep green, the picture cannot reflect that. Come meet him in person. About his color: Shaded is the degree of tipping. The color extends further on the shaft, usually about half the way. The color is darkest on the back, creating a mantle of shading. 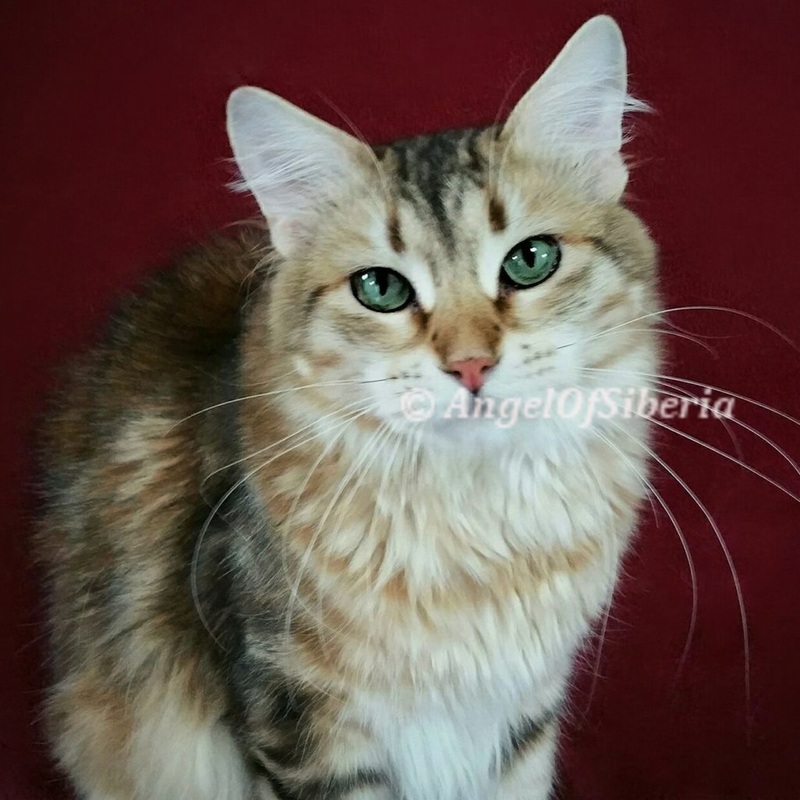 Golden – there cats do not have regular brown tabby markings, but the two colors (black and golden) are blended one with another, the lighter golden tone predominating. These cat colors are rare. These cats are late in maturing and do not acquire their marvelous coloring until about the second year of life. Jeweler’s mother is lovely Angelur Zarnitsa (left picture). Jeweler’s father is dashing Angelur Veresk (right picture). 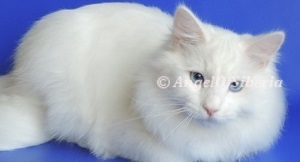 Description: Our first solid colored cat, very large and handsome boy with the sweetest personality. He still acts as a kitten, mischievous and curious. He loves to be carried around the house and loves to nap in the sun. His eyes are large and deep blue. 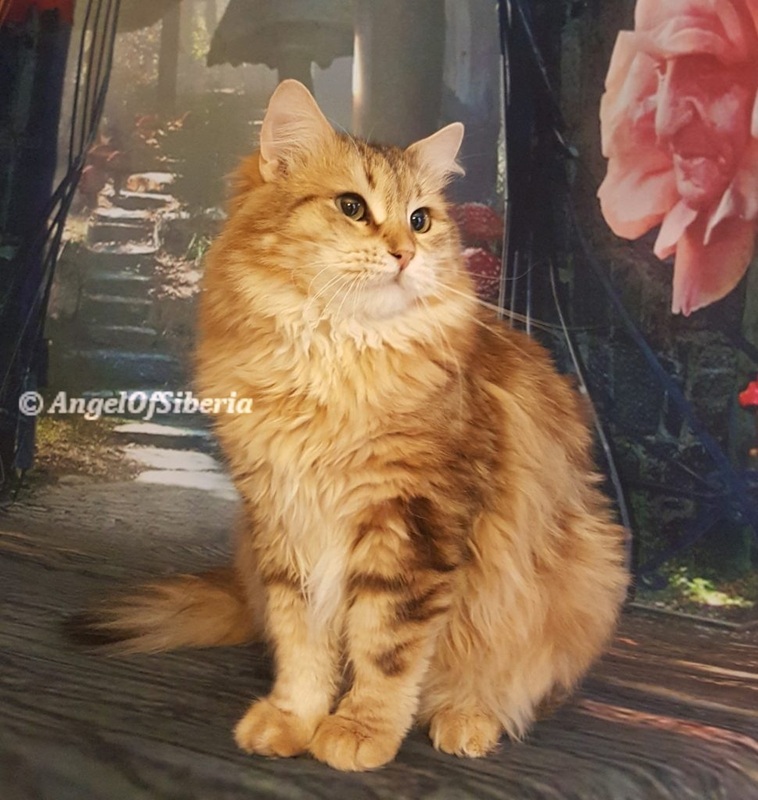 He is our Casanova, he flirts with all the girls in the cattery. He has 27 champions in his 4 generation pedigree. Only 5% of general cat population is white cats (i.e. pure white). We are proud to own one of the rarest colors. 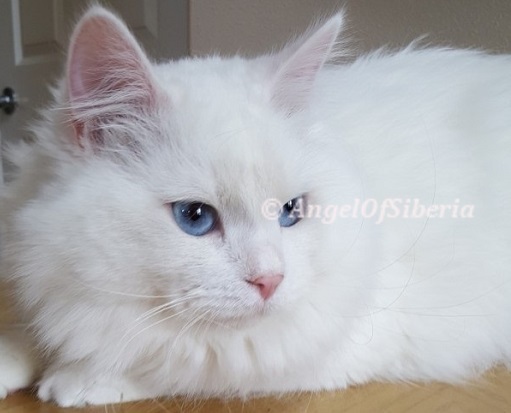 Jasper’s beautiful mother (left pic) is Gordyana Angel Neva. Jasper’s father (right pic) is named Zhaks Angel Neva. Description: Our very sweet boy joined us recently and already won hearts of all of our family members. He purrs loudly and is always engaged with our children. He really likes belly rubs and enjoys being brushed. About the color: Blue Lynx means gray stripes on the face, extremities, and tail. 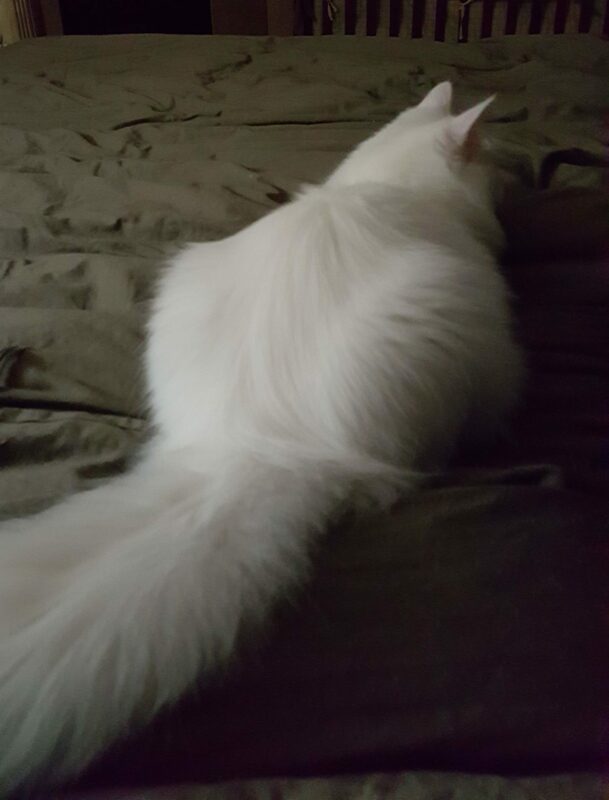 With white means the the tips of his four paws are white. 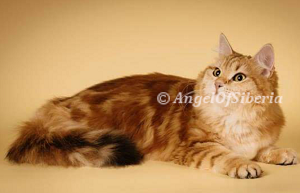 These colors are late in maturing and do not develop until the kitten is 10-11 months old. Thunder is registered with TICA. He also has pedigree information. All documents are available upon request.